Propane / Service Map | Griffin Oil and Propane | Suffok Energies, Inc.
Griffin Oil and Propane | Suffok Energies, Inc. Distributor of heating oils, gasolines, diesel fuels, bulk lubricants and propane gas for Southeastern Virginia. Griffin Oil & Propane serves Southeastern Virginia with heating oil, diesel fuels, gasoline, propane, and lubricants through our own fleet of modern service and tank trucks. We serve our core residential, commercial, and agricultural customers from offices in Suffolk and Wakefield. Our goal is to provide the below cities and counties with the most reliable and fair propane service! 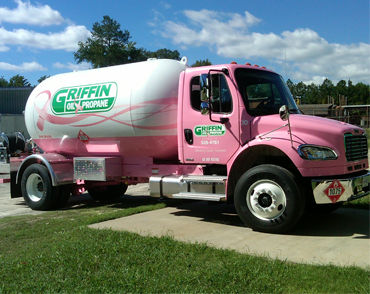 To raise cancer awareness throughout the region, our striking pink propane truck is estimated to travel 20,000 miles year around delivering propane throughout the City of Suffolk, Southampton, Isle of Wight, Sussex and Surry Counties. For every gallon of propane delivered to customers from our pink truck, a donation of $0.01 will be made to the American Cancer Society's Virginia Beach office. Contributions are estimated to be between $4,000 and $5,000 annually. Copyright © 2019 · Suffolk Energies, Inc.